Exterior colours | House by the water. In keeping with my plan to be extremely well prepared for my pre-start meeting, I’m working on my colour selections. This is the first post in a series, room by room, probably with a few diversions so you don’t nod off. Nothing is finalised yet, so as usual your suggestions and tips are welcome. 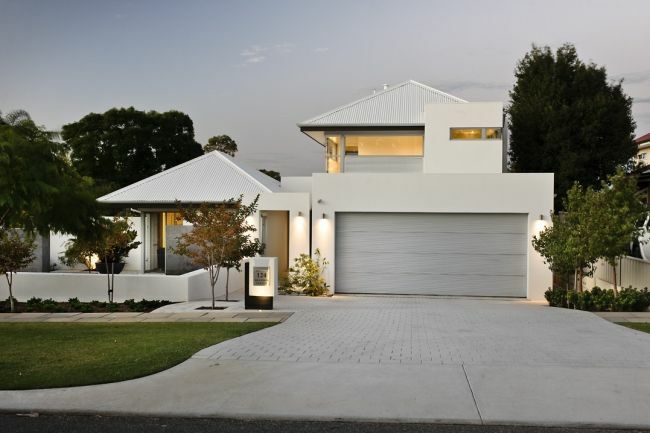 I love the exterior look of this house by Cambuild. Picture thanks to House Nerd. A Webb and Brown-Neaves house with a similar roof line and front elevation to ours. Maybe I can just ask WBN’s interior designer for colours “just like that”. 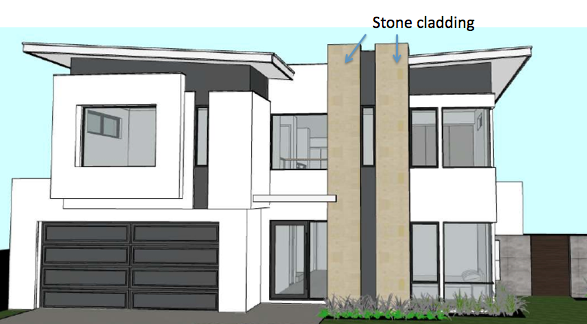 This is how the addition of a column of rock cladding might look. Picture source: Sustainable Outdoors. Despite a loyal reader warning me against white render due to soiling (think bird poo, water stains?, drunken insects not watching where they are flying, etc), I do like the grey- white colour scheme, and in the name of beauty, I’m going for that! I hope that the light colours will help to tone down the boxy shape of the house and will be a neutral backdrop for the garden. Too Grey? At first, I tried to blatantly copy the wall colour of the gorgeous Cambuild house shown above, using Taubmans’ “Milk Dew”, but it seemed to clash with my other colours. I suspect natural light and garden surrounds have a lot of influence on the colours. Help! Suddenly, I feel out way out of my depth. Edit: To see what I actually selected click here: Colour selections. You are having so much fun , Jo with those choices of colours. Very creative. I cannot comment on ovens’ (etc.) aspects of your new home but this time I can communicate my perceptions: So pale grey overall is beautiful ( Cambuilt home) for the reasons you are giving. Now in your draft A , there seems to be too many variations of grey, hence the clash, you are mentioning. Why is the garage yet another shade of grey? and yet another one the roof cladding? If you did not have the feature of ” the rocks” , perhaps that would be OK.
Notice that in the Cambuilt house, there are only two shades of grey. So I am suggesting to play again with colours and to get rid of 1 or even 2. Aside from the stone, there should only be two greys here. The roof and the garage are the same colour, both surf mist. They appear a little different because of the different material surfaces, I believe. The cladding and wall colour are the same, but in different strengths. The “clash” I mentioned refers to a different colour that I have not shown on my mood board. Hopefully, there is no clash here?? Thanks for commenting. “No worries”, The word clash is the wrong word. There is no clash of colours. Just in my opinion, as a very minor issue, perhaps one too many different shades of grey and this minimises the impact of your beautiful stone cladding. But as you say this is due to different surfaces. Anyway, your house is going to look so beautiful. Continue enjoying the planning, Jo. I like it! Probably because we have similar taste 🙂 We are going for a surf mist roof and garage, and a light colour render, but struggling to pick the exact shade. Kathryn, the HomeOne forum is a good place to see some facade colours. E.g. page 6 of this thread: http://forum.homeone.com.au/viewtopic.php?f=31&t=63516&p=1052915&hilit=kitty#p1052915 Try Kitty Grey or Cloud Sky? But if I was you, I’d be wandering around Mandurah and knocking on doors of houses with colours I like! I think Anne, the WBN interior designer, told us that the textured render they use makes the colours look slightly darker. When you meet with her, she should also be able to give you a sample of the render so you can see how it looks in the textured version. What colour window frames are you having? You might also like to think about how they will fit in with the colour scheme, and your front door colour too. And Anne can definitely look up for you the colours of the WBN display homes and other houses they’ve built, if you know of any you’re interested in. Thanks for the info Miranda. Good to know. I was thinking of white window frames, to suit the interior colours. At various times I’ve seen both grey and black window frames looking good too, so I could be swayed on that. As for the front door – at this stage we are having the standard issue, which is nothing very flash. I think it will probably need to be painted, greyish?? If I was to spend money on an upgrade to the door, I’d go for solid wood, but I haven’t got that far with plans yet. (Probably, I’ll stick with standard and change over after handover if I don’t like the initial result.) I was tempted to upgrade the height of the front door, but the cost was a bit exorbitant. Hi! This part is so exciting! I like your inspirations! Personally, I really like the contrast in the rendering – the dark gray behind the white with dark sashes/trim around the windows and doors looks sharp. 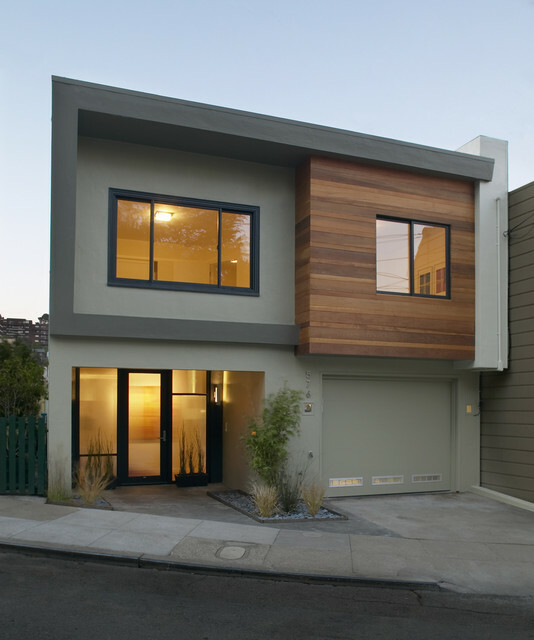 However, the monochromatic look is lovely and you’re right — landscaping will pop! I have one suggestion — I would consider using one of your wall shades of gray on the garage door (If that is an option). The rooftop is not visible so the garage door seems to stick out a bit rather than blend in. Perhaps using your darker color choice for the garage door (like the rendering) or the exact same color as the wall around it might be more complementary. Here is a link to one of my favorite sites that shows what a garage door same color as ext wall looks like! Thanks for your enthusiasm UrbanHaus. Your tips are great. I will recheck the garage door colour options. I think we have a fairly limited selection – but there may be a closer match to the wall colours. I shall review! Thanks again. Hi, new reader here and loving your blog! Beautiful facade you have to work with! We have very similar taste in colours so love your mood board. I agree with urbanHAUS about the garage door colour. Hi mf and thank you! I’ve been playing with the colorbond visualiser to see if I can get a better match of colors between the garage door and walls. I could chose “Shale grey” or “Dune” but they are darker than I’d like for the overall effect of the house. I will see what WBN’s designer has to say about it all. Perhaps she can show me some houses with my choices or similar. Looking good. I like your colour choices! We have gone surfmist roof, windows, and garage door as well. Our trim colour is woodlands grey (and downpipes) and front H of the portico. We’ve gone soft greens for the downstairs bag, and slightly lighter green upstairs. We struggled so much with the facade we bit the bullet and paid an interior designer to help. 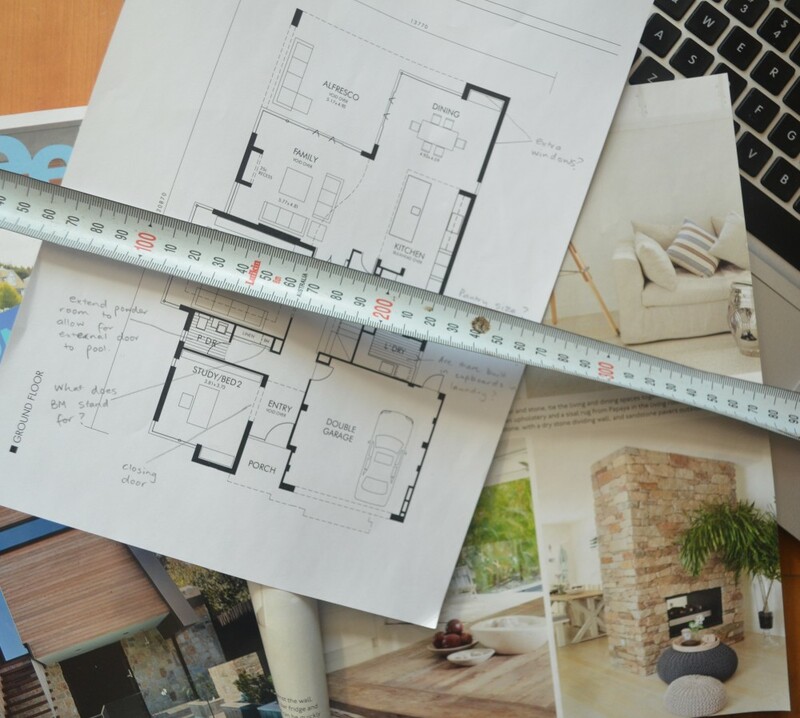 But we won’t know how good – or bad – it looks until it is well into the build! Love your choices – the stone will bring real warmth to the house. Did you do the sketch yourself? Thank you. The builders did the sketch for us. I wish I was computer savvy enough for that, then I could really play with the colours. Sounds like you have amazing builders! I struggle massively with google :-S Loving the progress! I also love the colour of the Cambuild house> I am struggling to match this. 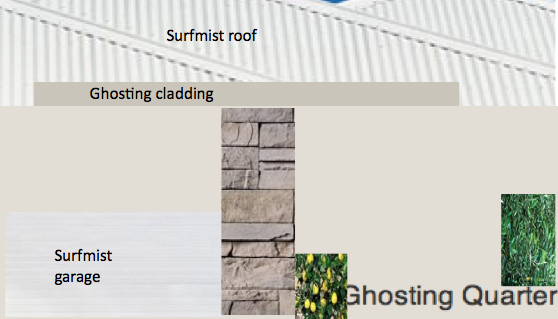 Is the colour of the rendering Surfmist? Thanks Joanne, much appreciated. I saw the photo of the house last year in a mag and have thought it may be Surfmist. So thank-you for your response. 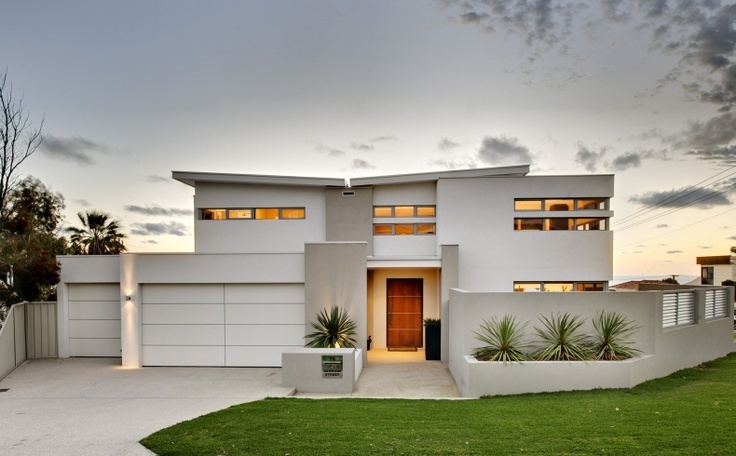 I am looking for a render colour for my house and wanted to keep it very simple and neutral. I have also been toying with Dulux’s Silver Illusion – and have tried full, 1 / 2 and 1/4 strengths – I get a different colour in different lights. Sometimes the colour looks greyish, then greenish and at times an off white! My home is in inner Melbourne – so not sure what colour to do. 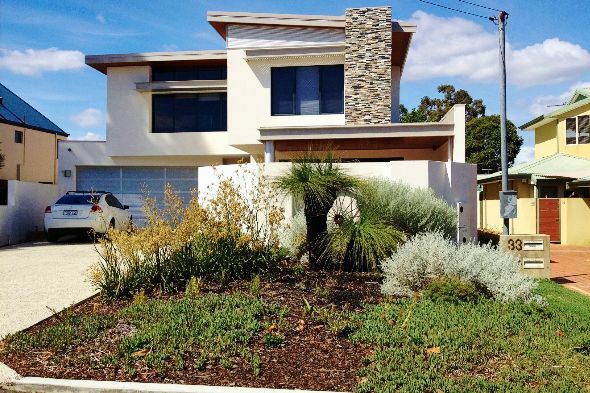 The Cambuild house is very similar to a house close to my partners home by the beach in Ocean Grove. The zincalume roof looks great with the Surfmist. Colour choices are tough. I knew what basic colour I wanted, but let our building company’s interior designer recommend the specific paint colour and strength. When I think of Melbourne I think of bluestone, so I’m no help to you! I’ve had a few walks around the streets of Ocean Grove, searching for inspiration. There are some lovely coastal places there, but you can also see how the ocean weather wears new houses quickly. My parents send me photos from Barwon Heads of great landscaping too! I must have a holiday in Melbourne again soon…. That Cambuild home at the top of the page; could you possibly provide the external colors please? I am in the process of choosing colors and was wondering if the external render was “Surfmist” at all, as I am considering this color? Hello Grant. If you click on the comments “bubble” at the top of the post you will find the details in one of the previous comments I made. Here’s the quote from the owner Grant: “the walls were painted with Dulux paint but the white tint was Taubmans “Milk Dew” @ 200% tint (we actually used “Milk Dew” inside as well @ 50% tint) the brown trim on the fascias was “Spanish Eyes” (acrylic low sheen – I think it is a Dulux colour). The Colourbond roof was “Surf Mist” and also used Zuncalume Mini Orb as a detail on front elevation.” Thanks for reading my blog! Man eyes excused! Hi, love your colour choices. Thank you Stacey. Unfortunately the answer is no. Exterior colours were the first item I selected at my pre start meeting. I brought up this house with the Interior designer and we looked at it on a screen, but next thing you know I’d agreed to Dulux “Grey Pebble” with “Calfskin” trimmings. I’ve no idea whether either of these colours are the grey you see on the WBN house above. Sorry that I’m not more help. The colours of that house are classic I think, and would be a beautiful and wise choice.